Decisions about interim analysis and early stopping of clinical trials, as based on recommendations of Data Monitoring Committees (DMCs), have far reaching consequences for the scientific validity and clinical impact of a trial. Our aim was to evaluate the frequency and quality of the reporting on DMC composition and roles, interim analysis and early termination in pediatric trials. We conducted a systematic review of randomized controlled clinical trials published from 2005 to 2007 in a sample of four general and four pediatric journals. We used full-text databases to identify trials which reported on DMCs, interim analysis or early termination, and included children or adolescents. Information was extracted on general trial characteristics, risk of bias, and a set of parameters regarding DMC composition and roles, interim analysis and early termination. 110 of the 648 pediatric trials in this sample (17%) reported on DMC or interim analysis or early stopping, and were included; 68 from general and 42 from pediatric journals. The presence of DMCs was reported in 89 of the 110 included trials (81%); 62 papers, including 46 of the 89 that reported on DMCs (52%), also presented information about interim analysis. No paper adequately reported all DMC parameters, and nine (15%) reported all interim analysis details. Of 32 trials which terminated early, 22 (69%) did not report predefined stopping guidelines and 15 (47%) did not provide information on statistical monitoring methods. Reporting on DMC composition and roles, on interim analysis results and on early termination of pediatric trials is incomplete and heterogeneous. We propose a minimal set of reporting parameters that will allow the reader to assess the validity of trial results. Data Monitoring Committees (DMCs) are central to modern clinical trials. They play a critical role in safeguarding both the interests of study participants and the scientific integrity of randomized trials This task is performed through interim monitoring of safety and efficacy outcome data, as well as vigilance over the conduct of the study and safety aspects/adverse events. One of the key activities of DMCs is to make recommendations to the sponsor or steering committee regarding the appropriateness of trial continuation. Thus, the recommendations of a DMC can influence the conclusion and interpretation of trial results and, indirectly, their implementation in clinical practice. to assess the quality of the reporting on the various different DMC characteristics and on information about interim analysis and early termination in these trials. A systematic review was conducted using a sample of four general journals (British Medical Journal, Journal of the American Medical Association, Lancet, New England Journal of Medicine) and four pediatric journals (Archives of Disease in Childhood, Archives of Pediatric and Adolescent Medicine, Journal of Pediatrics, Pediatrics), published from January 2005 to December 2007. The included journals have a relevant impact factor in their field, and are known to publish pediatric trials in a broad range of conditions and age categories. reported on the use of a DMC or interim analysis or early trial termination. Two searches were performed by one of the authors (R.F.). A Medline abstract search was used to identify the total number of pediatric trials for each journal, in order to obtain a denominator for frequency calculations. We used Medline's filters publication type "randomized controlled trial" and age category "0-18 years", and limited results to the specific journals and period under study. A separate full-text search was performed of the eight journals for the designated period of time using three full-text databases (HighWire Press, OVID, ScienceDirect). The search strategy for this full text search was adopted from Sydes et al and Montori et al[11, 15] The resulting list of search terms, aimed at a high sensitivity, includes variations on terms related to DMC, interim analysis and early termination. For general journals, we added terms to identify trials with participants within the pediatric age range, from previously validated search strategies The complete list of terms and the search strategy can be obtained from the corresponding author. Titles and abstracts of the full-text search citation results were screened by one author (R.F.) for eligibility criteria. Two reviewers (R.F. and J.L.) subsequently screened the full text articles of included citations independently to confirm inclusion appropriateness. Any discrepancies were resolved through discussion until there was consensus. Motives for exclusion were noted and all search results were kept in database form. There are currently only limited reporting standards for DMC related activities. Therefore, based on current literature, we defined a priori a set of parameters for data collection regarding DMC characteristics, interim analysis and early termination. For DMC characteristics and interim analysis, we consulted the book on Data Monitoring Committees by Ellenberg et al, and the report of the DAMOCLES group [1, 2]. The latter presents empirical evidence and a set of recommendations on various issues related to DMCs' policies, structure, decision-making and reporting arrangements We also included the CONSORT statement item on interim analysis Early termination parameters were obtained from recent reviews addressing the implications of stopping trials early[11, 13] For all three topics there appears to be consensus in the literature on best practices for some of the parameters, but many others remain controversial[2, 7, 12, 14, 29] Some items were not reported in the main report of the study, but in supplementary publications (e.g. online appendix, design/protocol papers). If these were referred to in the main paper, we included them in this review. We performed a descriptive analysis of collected data, stratifying results by type of journal (i.e. whether general or pediatric). All data analyses were performed using SPSS (version 14; http://www.spss.com). Our search using Medline filters identified 648 controlled trials including pediatric subjects (249 from general journals and 399 from pediatric journals). The full-text search for DMC, interim and early termination terms identified a total of 6,823 potentially relevant records, which were screened for inclusion criteria. A flow diagram showing the yield of both searches is shown in Figure 1. 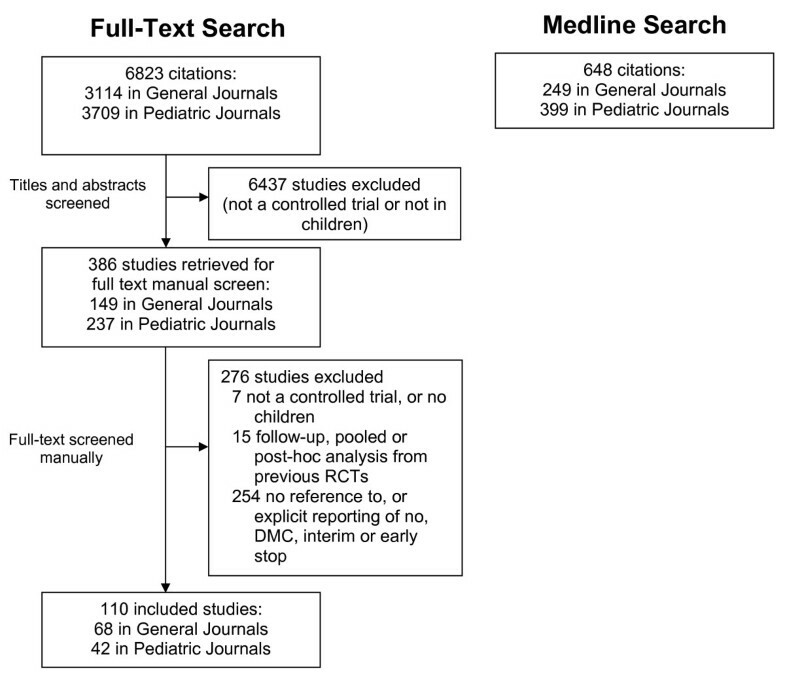 Overall 110/648 trials (17%) reported on either, or DMC, interim analysis, or early termination, and were included in this review (Table 1 and Figure 2) [30–139] Reporting on these topics was more frequent in general journals (27%, 68/249) than in pediatric journals (11%, 42/399). DMCs were reported in 81% (89/110) of included trials, of which 52% (46/89) also referred to interim analysis. Of 62/110 (56%) trials that explicitly mentioned interim analysis, 74% (46/62) also reported use of a DMC. Early termination of a trial was reported in 32/110 (29%) articles, of which 21 (66%) reported on a DMC and 22 (69%) referred to interim analysis. *The denominator refers to the total number of pediatric trials for each journal during the studied time period, which was obtained using Medline's filters (publication type "randomized controlled trial" and age category "0-18 years"). Flow of citations identified through screening for pediatric trials reporting DMC, interim analysis or early termination. Full-text databases search for DMC, interim analysis or early termination and Medline search for controlled pediatric trials, using Medline's filters. 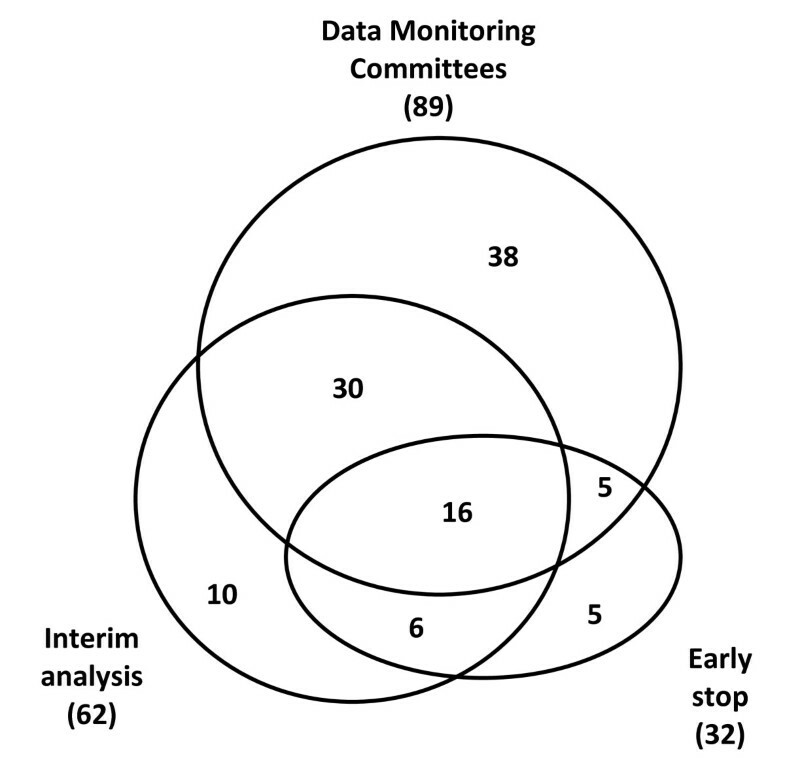 Venn diagram summarizing the overlap in reporting on Data Monitoring Committees , Interim Analysis and Early Termination (n = 110). Number within each circle is the total number of articles which reported on these items, in isolation or combination. The main characteristics of the included trials are summarized in Table 2. Most studies were designed as parallel, superiority trials (87%, 96/110). Two-arm, drug treatment studies were predominant (85%, 93/110, and 73%, 80/110, respectively). A placebo group was included in 48% (53/110) of trials, while the others used an active comparator. The majority of trials were multicentre, and in 80/110 (73%) North American or European/Russian centres were included. Outcomes included mortality in 51% (56/110) of trials. Studies published in pediatric journals most frequently included neonates and addressed neonatal conditions (52%, 22/42), in intensive care settings (50%, 21/42). The median sample size in these journals was 136, and 60% (25/42) included less than 200 participants. The sample sizes included in trials reported in general journals were substantially larger (median 601 participants). Studies published in general journals more frequently included adolescent or adult participants (51%, 35/68, and 41%, 28/68, respectively), and the most common diseases under study were infections (44%, 30/68). Planned sample size calculations were reported in most trials (84%, 92/110). Where reported, time to primary outcome was often less than 12 months (81%, 69/85), and the overall median recruitment phase lasted 30 months. †Each category is coded separately, so total may either exceed or not add up to 100%. Risk of bias assessments are shown in Table 3. We found average to high levels of adequacy in all parameters. Tables 5 and 6 show the reporting of DMC and interim analysis parameters in the included papers. The most frequently reported items in each category were the identity of DMC members (75%, 67/89) and the number of interim analyses performed (84%, 52/62), respectively. The affiliation of DMC members was reported infrequently (28%, 25/89), as was their independence from industry sponsors (37%, 33/89). The least reported items in each category were vigilance of trial conduct parameters beside safety/efficacy outcome monitoring (19%, 17/89), and the adjustment of results for interim analysis (31%, 19/62). No article adequately reported on all DMC parameters, i.e. members' identity and affiliations, independence, monitored outcomes, vigilance of other trial conduct items, blinding to outcome data and existence of predefined stopping guidelines (Table 5). Nine papers (15%) reported all interim analysis details, i.e. number of analyses planned and performed, parameter defining timing of these analyses, statistical methods used and outcomes to which they were applied, and adjustment of results (Table 6). We found two pairs of trials conducted by the same group of researchers, published in different journals, with distinct DMC nomenclature and reporting of most parameters[73, 77, 100, 119] We also identified some discrepancies between protocols published as supplementary material and the papers' reports of DMC activities and interim analysis, e.g. reporting of one but not all statistical stopping rules [117, 124]. Changes in protocol, most often sample size readjustments during the trial, were reported in 18% (20/110). The DMC was reported to have been involved in these decisions in 10 (50%) of these trials. The frequency of reported early terminated trials in this sample was 21% (14/68) in general journals and 43% (18/42) in pediatric journals. Four of these trials terminated one or more arms of the trial but proceeded enrolment for the remaining interventions. DMCs and interim analysis were mentioned in 21/32 (66%) and 22/32 (69%) of early terminated trials, respectively. Reporting of parameters related to early termination is presented in Table 7. Only 28% (9/32) papers referred to early trial termination in the Title or Abstract, and 41% (13/32) addressed the implications of early termination in the Discussion section. In five trials (16%) the reason, e.g. harm, or rationale, e.g. statistical rules, for stopping early was not clear. Planned sample size was unclear or not reported in 13% (4/32) of trials, and the majority did not state predefined stopping guidelines (69%, 22/32). Statistical monitoring methods were not reported in 47% papers (15/32), while 44% (14/32) did not state the outcomes under monitoring or analysis. Only five papers (16%) reported that the final results were adjusted because of the interim analysis, e.g. by using an alpha spending approach, four (13%) of which reported all interim analysis parameters presented in Table 6. Overall, only two trials (6%) reported all relevant methodological elements for interpretation of results from early terminated trials, i.e. planned sample size, predefined stopping guidelines, statistical monitoring methods used, rationale for early termination, timing of early stop (i.e. whether trial termination was determined by one of the interim analysis, and which parameter determined the timing of this interim), whether results were adjusted, and recommendation of DMC. Our study shows that the reporting of parameters related to DMCs, interim analysis and early termination in pediatric trial reports is heterogeneous and incomplete. This result is consistent with recent reviews of trials from various settings outside child health[8, 11, 13, 15–18] The CONSORT statement for standards of reporting clinical trials includes an item on interim analysis, but no details on DMCs or early termination We propose a minimal set of reporting parameters that will allow the reader of a trial report to assess their implications and the validity of trial results (Table 8). Also, we propose to update the CONSORT statement accordingly. Below we discuss the various components of this minimal set of reporting parameters, as they appear - from our study - to be relevant for the correct design, conduct and reporting of pediatric trials. Use of the standard nomenclature "Data Monitoring Committee"
†These recommendations are for main reports; further details could be available using other modes of publication (e.g. online appendices, trial design/protocol papers, web-based repositories), to which the report should refer to; planned items of this minimal set of parameters should be included in prospective trial registries. *Based on the book by Ellenberg et al, and the report of the DAMOCLES group ,. #Particularly regarding safety-whether it included adverse events and/or main efficacy outcomes. In a review of pediatric trials published until 2002, only 2% were found to refer to safety committees Reporting of DMCs was more frequent in our - more recent - sample of pediatric studies, but our results are comparable to those in other recent reviews covering all age ranges[15, 18] This suggests a recent increased use of DMCs, but other relevant factors probably account for this difference. First, bias may have arisen from using a selected sample of high-impact journals, as reporting of DMC may differ according to publication practices and trial results. Second, differences observed between general and pediatric journals in the current review may be confounded, as we can expect trials published in high-impact general medical journals to have characteristics which are more frequently associated with the use of a DMC (e.g. large samples, new interventions). Deciding whether a clinical trial actually needs a DMC involves consideration of the safety of the interventions under study, the type of outcomes, and which population is included, among other items[1, 4, 5, 7] Regulators recommend considering DMC involvement in the presence of vulnerable participants, such as children, but these are mere recommendations without obligations and no further operational guidance is given[4, 5] We found that DMCs are being reported in trials with participants of different age ranges and a wide range of conditions. These include serious, potentially fatal diseases (e.g. leukemia, bronchopulmonary dysplasia), but also minor conditions (e.g. caries, pharyngitis). Pediatric trials most often have specific ethical, safety and design issues that make a DMC indispensible, and, therefore, various pediatric specialty committees recommend their use[24, 140–143] Given the results of this study, we feel there is a need for a standard in the field of pediatric trials, including operational criteria for the establishment, roles and conduct of DMCs. We recommend to consider DMCs at least for pediatric trials concerning serious conditions and in which the recruitment time is long compared to the follow-up time for individual participants, which makes interim decisions with consequences for further inclusion possible. Three main models for the composition of a DMC have been proposed previously, with varying degrees of independence from the research team and the sponsor[1, 7, 145] First, trials may have an "internal" DMC with non-independent members, e.g. the principal investigator, or they may have a monitoring plan without a formal DMC. A second option is to include only members not involved in the trial, except for the trial statistician, who acts as the DMC statistician. Third, all DMC members, including the statistician, are independent In any case, appointment and funding by sponsors may affect this independence[4, 5] Knowing how a DMC was established is paramount for accepting the integrity and for the credibility of this DMC's decisions. Trial reports therefore should identify members and their affiliations, and disclosure of conflicts of interest should be made available. They should also make a clear statement about their independence, possibly with an operational definition (see Table 8). Our findings show inadequate reporting on which roles were taken by a DMC and how they were performed. Ellenberg et al states that monitoring safety, efficacy and other trial conduct parameters are among main DMC activities Activities should be clearly agreed upon and defined in advance by DMC members, trial sponsors and investigators, preferably using a "charter"
Outcome data may be monitored in a number of ways, particularly safety data, which can include either or both adverse events and other safety/efficacy outcomes There is controversy as to the blinding of DMCs Reporting of these procedural aspects is needed to allow clinicians to judge decision-making (see Table 8). We found discrepancies in reporting of the statistical monitoring plan and the use of interim analysis. Ellenberg et al highlight the relevance of predefined stopping guidelines, including a prudent use of statistical boundaries Indeed, performing multiple looks at data through interim analyses without correction can lead to multiplicity problems, with increased risk of type I error A number of statistical monitoring methods have been developed to overcome this issue, among which the frequentist, Bayesian and likelihood approaches As each statistical method has different assumptions and implications, reporting should be clear and unequivocal[2, 10, 29, 148] Additionally, there are differences between analyses aimed at efficacy, harm or futility, as well as the possible use of alternative trial designs (e.g. adaptive) This is compounded by a nomenclature which is often inconsistent and overlapping (e.g. "adaptive designs" vs. "sample size reviews") Clear reporting should allow readers to identify these methods and their impact of on type I and II error risks (see Table 8). We found similar deficiencies in reporting on early termination as were reported previously in other samples of trials[11, 16, 17] A significant number of early terminated trials did not report on the existence of a DMC or on its role in early stopping. This raises doubts as to which trial oversight group recommended termination, and whether this recommendation was issued independently from sponsor and principal investigators. Understanding the rationale for early termination is paramount to a correct assessment of the validity of trial results. This implies knowing which, if any, statistical monitoring methods and stopping rules or guidelines were used, for which outcome (whether primary or secondary), and at which stage of the trial[11, 13] It may be relevant in some cases to check if the results were corrected for multiplicity The ongoing controversies regarding early termination highlight the need for transparent reporting of these items (see Table 8). Our full-text search strategy allowed a thorough review of all published content in the selected journals. This strategy was chosen since the reporting of DMCs, interim analysis and early termination is not indexed in Medline records, and it is often not reported in the abstract. We opted to use Medline's filters to identify pediatric controlled trials, although we can expect some indexing inaccuracies. We only analyzed published reports, and we did not contact authors to evaluate whether DMC and interim analysis were used but not reported. This will likely lead to an underestimation of their actual use, as previously observed with the reporting of other trial methodology issues Reports of studies in which DMCs had an active role, particularly when early termination decisions were taken, may be also more likely to report details on their activities. A relatively large proportion of trials from general journals included adult participants. Results from these trials may not apply to studies that were designed to include children exclusively, as these trials may differ for example regarding the presence of a DMC and its tasks and procedures. There was a moderate to high level of adequacy in the reporting of risk of bias parameters indicating good adherence to the CONSORT statement on these items. These results show that there is an apparent shortcoming in the reporting of DMCs, interim analyses and early termination, even in trials which appeared well designed and reported in other aspects. Until CONSORT requires more information of DMC activities, we expect that reporting will remain poor. Therefore, we propose to update the CONSORT statement according to the recommendations described below. Reporting of DMC activities, interim analysis results and early termination of pediatric trials is incomplete and heterogeneous. New standards for the reporting of these parameters are necessary in order to evaluate their impact on the validity of trial results. We would like to thank Lisa Tsjovold (Edmonton) for help with the search strategy, and Dr. M. W. Tanck (Amsterdam) for statistical advice. Ricardo M. Fernandes is supported by the Calouste Gulbenkian Foundation (Programme for Advanced Medical Education; http://www.gulbenkian.pt. All authors contributed towards the conception and design of the study and the interpretation of the data. They also read, edited and approved the final manuscript. RF performed the full-text search. RF and JL identified relevant studies and participated in the data extraction and data analysis. RF drafted the manuscript.